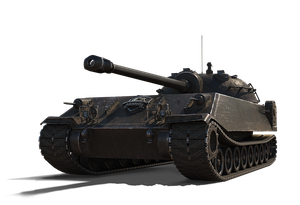 This weekend, you can get yourself a tough American cookie: the VIII Chrysler K GF ! This vehicle features incredible frontal armour and high damage per minute, and is sure to become one of your favourites if you're a fan of heavy tank action. Just watch out for flanking attacks. Its side and rear armour are not as reliable as the frontal armour! Click on the bundle names below to display more information. Remember to log in to ensure you can see all the packages on sale!